While orchids may seem exotic to many who live in colder climes, they are in fact the most diverse flowering plants on the planet, with over 22,000 described species. The family, Orchidaceae, is characterized by two-sided symmetry, a single modified petal and small seeds, and typically anchor themselves in ways uncharacteristic of many other plants. It is this method of anchoring that establishes a relationship between the orchid and the tree. Orchids can be easily divided by what they choose to anchor upon. Most orchids are epiphytes, meaning that they grow on another plant. They are not parasites, instead pulling their nutrients from the air and sun. Other orchids are lithophytes, meaning that they latch on to rocks, rather than trees. Plant species that cling to trees but parasitize their host are not considered true epiphytes. While the relationship between orchids and trees is a form of symbiosis, it is not mutualism, where both parties benefit. Instead it is what is known as commensalism, when one party benefits and the other is unaffected. The epiphyte lifestyle has several advantages over a more ground-based survival. Orchids, which are often found high in tree canopies, are less likely to be consumed or trampled by ground grazers. By opting not to absorb nutrients from the soil, the epiphytic orchid must depend more on the sun, making elevation of particular importance. In order to maintain their particular lifestyle the orchid has developed a number of adaptations that makes them the perfect epiphytes. Their seeds are typically so small as to be microscopic, meaning that the wind easily carries them, often in vast quantities. This increases the chance of pollination in the higher levels of the canopy. 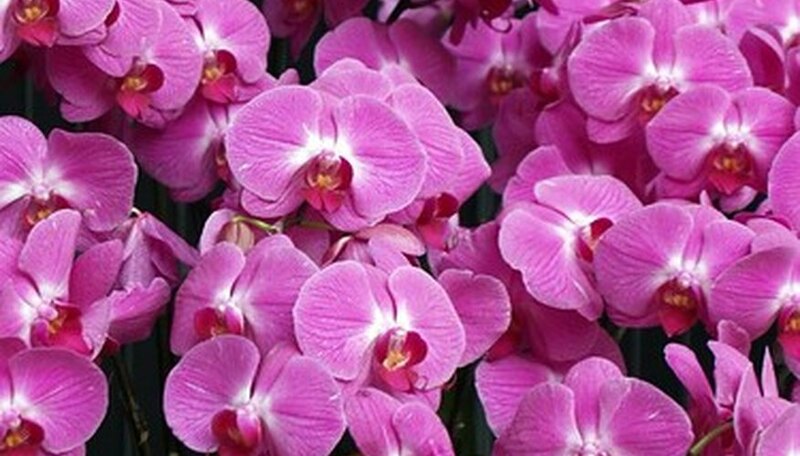 Moreover, orchids excel at pulling moisture from the air. Mist and slight dampness is just as helpful to an orchid as pounding rain. Those who wish to grow orchids often face a very different challenge from other forms of flower growing. Plants must be frequently misted, but never over-watered. Most importantly, orchid growers must find a way to reproduce the open, airy conditions that orchids and other epiphytes encounter in the wild. This often means growing orchids in a loose wood medium, such as bark chunks. Based in Seattle, Louie Doverspike has been a professional writer since 2004. His work has appeared in various publications, including "AntiqueWeek" magazine, the "Prague Post" and "Seattle Represent!" Doverspike holds a Bachelor of Arts in English from Hamilton College.